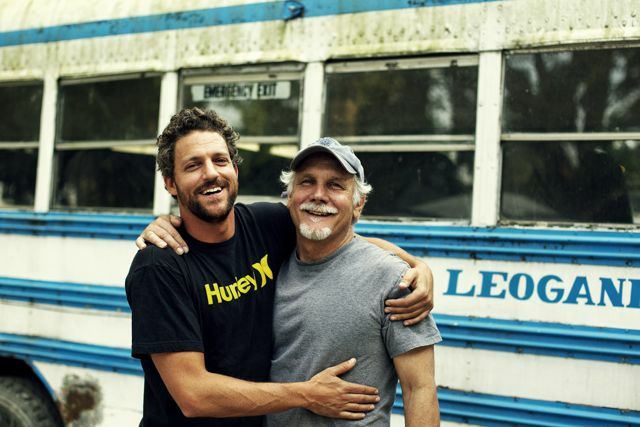 Initiated by Jack & Jon Rose, Water 4 Everyone is a campaign that believes safe drinking water is a basic human right. To put this goal into action, Jon started the non-profit Waves For Water, for the purpose of partnering with individuals, corporations, humanitarian organizations, United Nations, and government agencies around the world to provide a variety of clean-water solutions . . . Solutions include: the distribution & education of filtration & chlorination programs – rainwater harvesting systems – water-well restorations . . . “A point-of use, hollow fiber filter, installed in an ordinary 5 gallon bucket immediately relieves suffering, and dramatically reduces the risk of death, caused by water-borne disease. 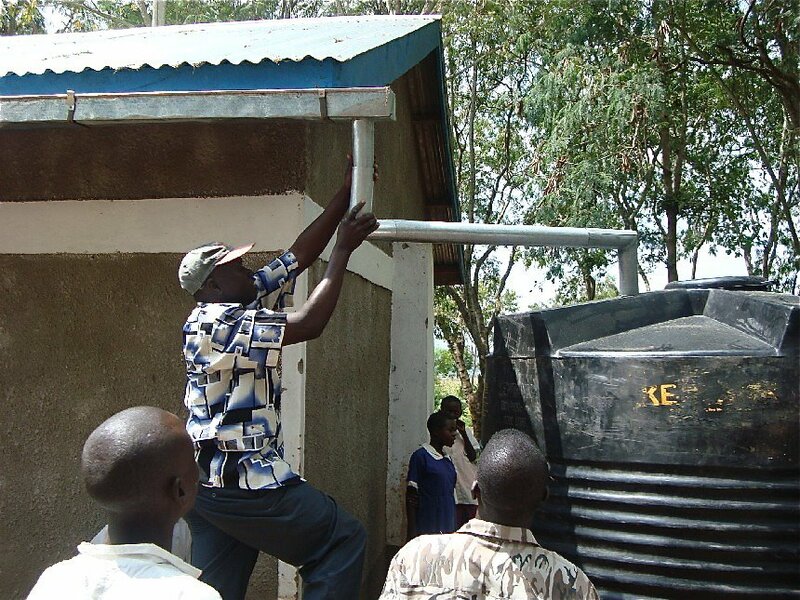 A point-of-use solar electric chlorinator brings safe drinking water to 5,000 people a day”. The most practical awareness I’ve gained from years of service is how simple it is for a curious & concerned world traveler to throw a few filters in their luggage and completely change lives, in a matter of minutes, upon arrival in any remote region of the world. On this site I’ll continue to post a variety of subplots and outtakes, musings and discoveries, that naturally spring from long walks down dusty roads in the middle of faraway lands. Life for me is a jigsaw . . . with no edge pieces. Countless human stories interlocking and disconnecting daily, forming a living, breathing puzzle never to be complete, and seen in totality, by no one. Speech for the Youth Environmental Summit in Japan. Written by Jack Rose . . . Delivered by Dennis Haysbert. A World Bank/United Nations Development Program report called “Learning What Works” strongly criticized mega-projects and called for small technologies and community control of water. People in the United States drink over 2.5 billion gallons of bottled water each year, an amount equal to a single days’ rainfall on the side of one mountain in Hawaii. California has the Sierra Nevada to catch & release fresh water each year for tens of millions of Californians. But, most people don’t have a big mountain in their backyard, so I began playing with the idea of small mountains. Everywhere in the world, the resource and the need exist side by side. By placing small mountains (rain gutters & water tanks on houses & schools) in the path of the coming rainy season, thousands receive home delivery of the best water on the planet. Instead of one big mountain, the idea is to scatter thousands and thousands of little ones over an entire continent. All these small efforts add up to the same result: billions of gallons of life-giving water. Simple rain catching systems are set up in a day by the people who will be harvesting the water. The cost is minimal. For a while, more rain will fall than we will be able to catch, but our goal is to catch enough in each region so that everyone can enjoy, year round, the simple pleasure of a clean glass of water. “Some day, after we have mastered the winds, the tides, and gravity we shall harness the energies of love. Then for a second time in the history of the world we will have discovered fire”. My “catching rain” presentations always begin and end with a conversation about the importance of “catching fire”. If we catch fire, water will be plentiful, new opportunities and possibilities will suddenly become obvious, and we will have the energy to implement new solutions to old problems. August, 2009 – Reporter Jarrod Holbrook and RainCatcher Fred Mango document the installation of rainwater harvesting systems on rural schools across Kenya. “There are many problems in the world that seem unsolvable, clean drinking water isn’t one of them. “Kenya & Uganda: 100% successful mission. As we venture to the far edges of the earth, bringing goodwill and reverence for life, we are received like firemen at a burning building, except the fire is literally in the belly of innocent children. By the time we leave each school, bouncing down the red dirt roads of equatorial Africa, the fires caused by water-bourne diseases are well on their way to being extinguished. The awful belly fire is something I know from experience. The pain is like a knife being thrust into your stomach. So, alongside the millions who die from drinking contaminated water, there are countless others who endure intense pain as a part of daily life. Everywhere we go we are greeted by people who know what we know: That securing a reliable source of safe drinking water is the #1 top priority. This shared knowledge is the common ground where our friendships begin and upon which our collaboration continues. 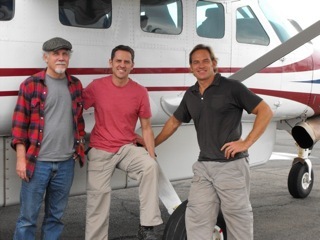 And so begins a journey of hope – with many turns and detours and setbacks. This is the road we have chosen to walk. Our stride is steady, we never stop. The people are amazing and happy . . . and free of the burdens their counterparts endure everyday in the first world. It is we who receive fulfillment from those we travel far to serve. I was fortunate to be involved recently with the Waves For Water Game Changer Project in Haiti: Three partners, W4W, Hurley and Nike, joined forces to bring clean-water systems and 800 new soccer balls to schools across the country. This effort turned out to be a game changer not just for the kids who received, but also for all of us working, from inception to completion, for the past year on this idea. The result: kids get to stay alive and have fun at the same time. Shortly after this effort I was getting ready for a big RainCatcher / Beachbody Clean-Water project in Kenya & Uganda. I asked Tom DeBlasis, of Nike, if we could bring Game Changer balls to our school projects in Africa . . . and he just happened to have 80 bright orange, rubber soccer balls sitting in his office. I carried 44 in my luggage. The rest is history. What a difference a ball makes. 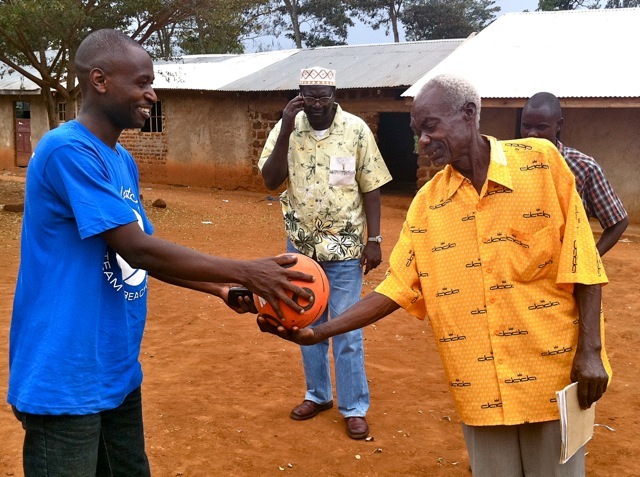 Thanks to the collaboration of RainCatcher, Beachbody, Nike and many NGO partners throughout East Africa (including the Catholic Church), thousands of students have replaced homemade soccer balls with real ones. RainCatcher + Beachbody + Nike = fun and long life for many. RainCatcher’s collaboration with Malik Obama, our president’s brother. Malik, born and raised in Kenya, graduated university in Nairobi, then spent many years in America. 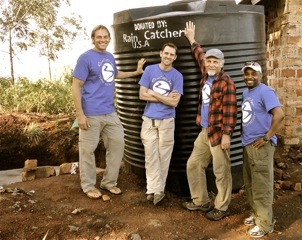 Thanks to Malik, and the extensive work and travel of the entire RainCatcher team, schools in Kogelo (the Obama ancestral village) now have rainwater harvesting & filtering systems . . . and thanks to Nike they also have new soccer balls. All’s Well That Ends Well – Uganda – The following is a story that ends well. 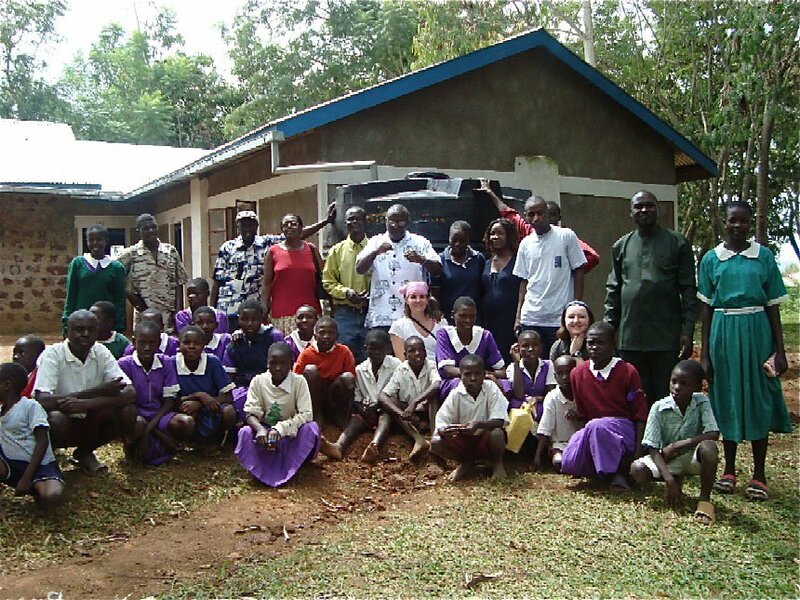 That’s Martha McBride – with children of Kigungu village. A typical work day has me walking down red dirt roads of Africa, accompanied by crowds of people who have gathered to watch us turn water that takes away life into water that gives life. Together we walk down the trail from village to local water source, which is always contaminated. We scoop up water that looks like chocolate milk, pass it through our simple bucket filter system, and then watch everyone marvel as disgusting, diseased carrying liquid comes out clear & clean drinking water. We do this day after day, year after year. What if people no longer had to carry filthy water, long distances, from source to home? On the previous trip to Uganda, our usual water walk took us past the dead well pictured above. As we passed it a second time, on our way back to the village, I asked Dennis (RainCatcher Uganda) to get me a quote from local technicians for disassembling this pump, replacing all internal parts, and reinstalling brand new pump. 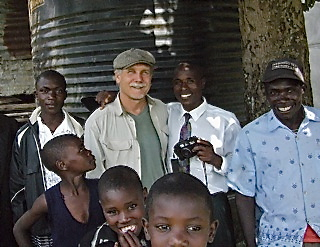 Thus began the first RainCatcher Well Restoration Project, which I nicknamed The Lazarus Project – because the purpose is to literally bring new life to dead wells, of which there are thousands scattered throughout Africa. Cost to resurrect a dead well in Uganda: $300. The well in photo above had been dead for two years. It now provides an endless stream of clear water for an entire village. Most such bore holes average about 20′ deep. The water available at this depth is a much better source than the muddy rivers, lakes and ponds it replaces, but it still may carry lethal pathogens. So the next step is to clean it with point-of-use hollow-fiber water filters (attached to yellow jerry can in photos) This, of course, is our specialty. 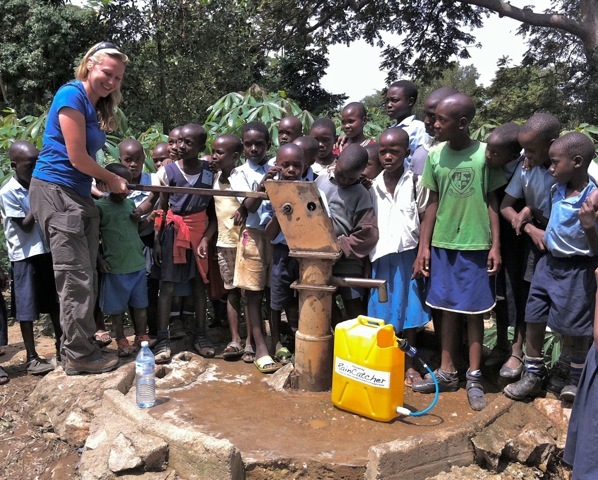 By combining well restoration & water filtration we can bring a new water source to any community that has a dead well. Soccer balls donated by Nike.